On Hawaii Island, renewable generation reached 57 percent. Hawaiian Electric is currently updating its numbers for 2018, but spokesperson Peter Rosegg said thevolcanic eruption on Hawaii Island — which took out a 38-megawatt geothermal plant — means its renewable portfolio standard will be relatively unchanged. The company said it’s still on track to reach its RPS milestone of 30 percent by 2020. Just a reminder, we are the first to propose a solar generator in space that will beam RFwavesdowntoareceptorsiteandconvertittoDCcurrent. Wehavechangedour receptor site from the Mojave desert to Sebastopol. 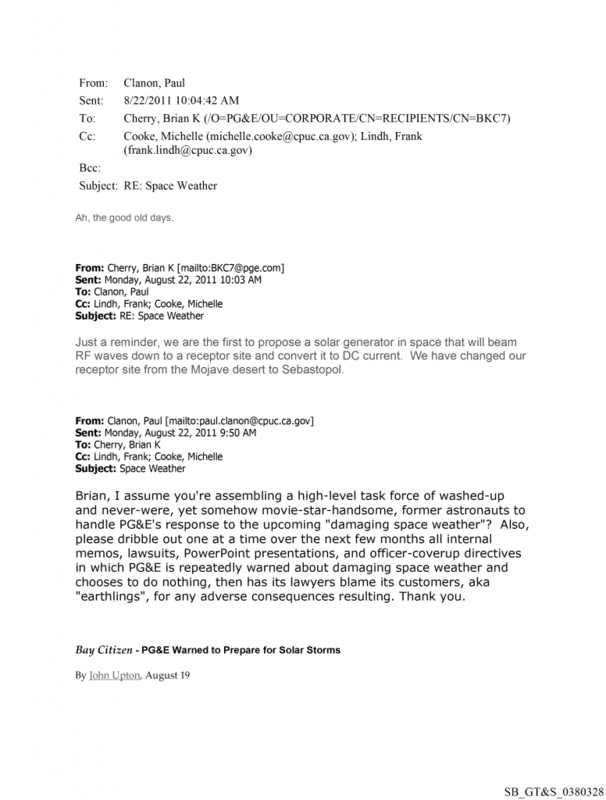 and never-were, yet somehow movie-star-handsome, former astronauts to handle PG&E’s response to the upcoming “damaging space weather”? Also, please dribble out one at a time over the next few months all internal memos, lawsuits, PowerPoint presentations, and officer-coverup directives in which PG&E is repeatedly warned about damaging space weather and chooses to do nothing, then has its lawyers blame its customers, aka “earthlings”, for any adverse consequences resulting. Thank you.